The use of poison in Spain…. What is it killing? With the latest news coming from Zamora that includes a Spanish Imperial eagle, amongst other carrion birds, killed from the consequences of poisoning, I thought I’d have a search around the net for similar news and information. The Vulture Conservation Council has an interesting page explaining the use of poisons that has affected Spanish Vultures. It’s interesting that on the Black Vulture page at Priorimancha.es the population statistics for black vulture are from 2006 and It seems it is impossible to find any published statistics for 2012 or 2013 on any official “medio ambiente” website. In 2006 the Spanish population of black vultures was calculated at 1,845 breeding pairs, 138% more than the 1988 census. In 2006 a total of 367 breeding pairs were located in Castilla-La Mancha, as opposed to 274 pairs registered in 2001. The most important nucleus is in the National Park of Cabañeros and its area of influence, with 216 pairs, followed by 129 pairs in the Alcudia valley, 20 in Sierra de Los Canalizos and 2 definite pairs on the River Guadiana. The general trend of the species in Castilla-La Mancha is very positive, although it is difficult to ascertain the real increase as estimates before 1980 are not complete. 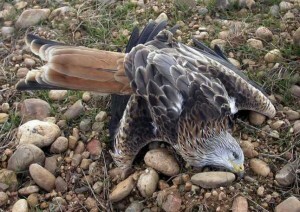 It is also very interesting that even though poisoning has been one of the identified causes for raptor deaths and laws have been implemented, this practice continues to be used across the Iberian peninsular. The destruction of their nesting habitats, along with the use of poison and the electrocution of birds on power lines, caused a huge fall in species numbers during the 20th century. Also, the enforcement of new legislation on animal health in recent years has produced a decrease in the availability of carrion and cattle remains, a circumstance that also seems to be having a negative effect on the species. The conservation measures adopted, such as prohibiting the use of poison, the conservation of nest-building areas, the correction of power lines, and the creation of rubbish tips have given rise to a spectacular recovery experienced by its populations in recent decades. The trend is very positive in all groups, with the exception of the Sierra de Los Canalizos where a considerable reduction in the number of breeding pairs has been recorded, observing the disappearance of 45% since 2003. The original article about the latest poisoning (in Spanish) can be found here. And, of course there is a new topic on this subject over at the Iberianature Forum. Join in with comments over there.